Sentiment in the export log market has turned negative and price reductions are expected over the next few months. Since this would cause an inflexion point in the market (change in direction), this issue of Wood Matter’s Log Market report is devoting more attention to the Outlook section at the end of this report. Export log prices flat-lined in June but with a backdrop of unfavourable developments. At about the same time as most NZ at-wharf-gate prices were being set for the month, reports were coming in of in-market “A” grade price (CFR price) falling by US$5-7/JAS m3. 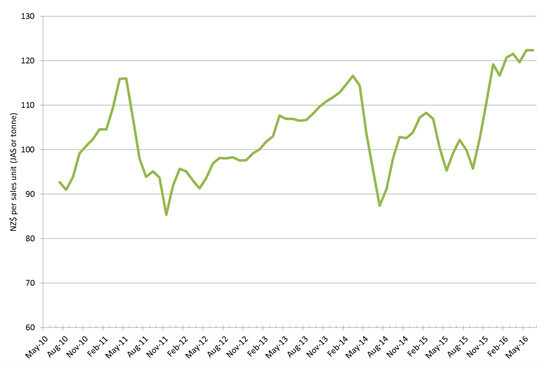 For most suppliers this decrease will impact on June prices (see Outlook – Export Logs below). Log stocks in China are reported at 2.5 million m3, down on last month’s 2.6 million m3. Normally this would be supportive of log price! The reason it is not, however, is that sentiment and near-term outlook has turned negative and this has led to weak sellers taking price-drop sales. These will likely trigger a flow-on series of price drops. 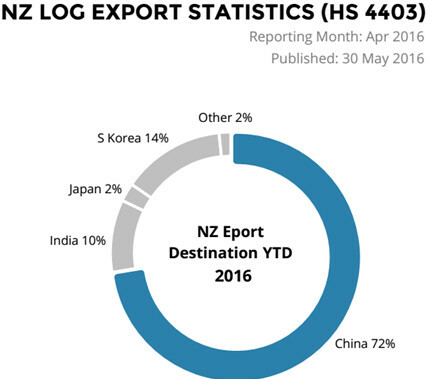 China continues to be New Zealand’s most important log export market with nearly three quarters of all logs exported going to this market (see chart below). A big driver of the log market in China is other softwood imports. These sources compete with Radiata pine from New Zealand. A big component of softwood import volumes into China is softwood lumber. Whilst softwood log supply from Russia has been declining for years, supply of softwood lumber has been increasing. This trend was boosted about six years ago by log export tariffs imposed by Russia (lumber avoided the costly tariffs). Despite the tariffs being subsequently eased, the investment in producing lumber in areas such as Siberia and Russia’s Far East has burgeoned. In 2005 Russian exported just under one million m3 to China; in 2015 volumes reached nearly 10 million m3. This supply of softwood lumber, most of which enters overland by rail, is more difficult to monitor and has a bigger impact on the log market than log sales since it is already converted to the saleable end-use product (whereas logs have to be converted at, say, 75% conversion factor). These changes affect the dynamics of the market and the challenges related to understanding and forecasting what might happened to the demand and price of New Zealand Radiata pine in China. The drivers in the domestic log market really haven’t changed since last month. If anything, the primary driver (the housing market) has strengthened as Auckland (and now other regions’) property prices soar and daily media commentary includes sound bites of “housing bubble”, “out-of-control private debt” and “why isn’t the government fixing the problem”. With much of the focus on “fixing the problem” involving increasing housing stock, it’s probably reasonable to expect the New Zealand domestic wood market to remain favourable for the foreseeable future. However, the domestic wood market is not without its challenges to domestic wood processors. Whilst visiting a friend’s house construction site over the weekend, your editor was shocked to hear that Chilean plywood was being used on the site in preference to the equivalent NZ product. When I indignantly challenged the proud soon-to-be house owner (implying a concerning absence of buy-Kiwi loyalty), I was told that delivered to site, the Chilean product was 30% cheaper, and good quality. When a couple with a young family is climbing into house ownership in an increasingly un-affordable market, it’s hard to get too righteous about supporting domestic processing if it means adding considerable cost to building a new family home. There are no easy answers here. 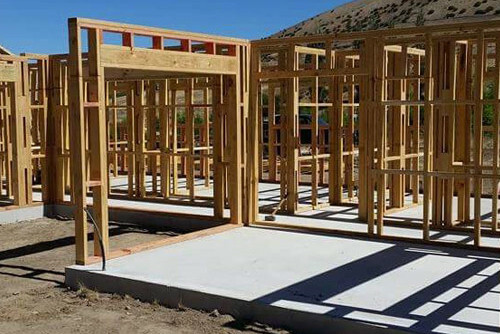 New Zealander’s strong preference for wood-framed housing and a strong property market is a boon for domestic wood processors although they still have to compete with low-cost producers in Chile and Europe. The PF Olsen log price index flat-lined in June at $122. It is still $35 higher than its 6-year low of $87 in July 2014 and $17 above the two-year average and $19 above the five-year average. Sentiment in the export log market has turned negative. Whilst log stocks in China are still at levels that typically support a robust market (2.5 million m3), a number of short-term concerns are becoming more prominent. In-market (CFR) prices are reported to have fallen by as much as US$7/JAS m3 with some traders. This has yet to flow into most NZ$ at-wharf-gate pricing. Whether the in-market price falls any further will depend partly on the level of resistance from NZ exporters to further price falls, but also on how the supply-demand balance plays out over the next few months. China is entering its “hot season” – summer, which is also the “rainy season” - monsoon. Toward the end of summer is the “harvest season”. During this time of year, construction activity slows due to a combination of the effect of climate on productivity (initially) and reduced labour availability (latterly), as more workers divert attention to bringing in the crop harvest. This reduces demand for logs. How much this affects log price will depend on the extent of the reduction in demand, and, of course log supply volumes during this period. Based on log export volumes reported by Champion Freight from the various export ports around New Zealand (see chart below), New Zealand isn’t putting any additional log export supply pressure on the markets. We also expect a fall in log production over the next few months as cold, wet weather hampers production in poorly-roaded blocks and those with more sensitive soils. There is considerable talk about strong log export volumes coming out of Australia, but as discussed in the May 2016 Log Market report, they probably peaked in 2015 and are likely to decline thereafter. Russian log supply typically declines at this time of year as harvest levels reduce during the ground-thaw. The Pacific North West is increasing supply currently, but this is not expected to get to levels sufficient to significantly increase log stocks in China. On balance, it’s hard to see a compelling case for the in-market (CFR price in US$) to fall much further. However, the NZ$:US$ cross rate has moved up from 0.68 at the beginning of June to just under 0.71 in mid-month trading. If this was fully imputed into “A” grade price, this is a NZ$9/JAS m3 “haircut” for at-wharf-gate price. If the exchange rates persists over 0.70, this will put added downward pressure on NZ$ at-wharf-gate prices next month. The final leg of the three-legged pricing table is ocean freight. Bunkers (fuel for ships) and vessel charter rates have been in a firming trend for the past few months. This has continued in June albeit modestly. Adding to upward pressure on ocean freight rates is the heavier winter logs which lowers the stow factor of log cargoes. In summary, there are multiple factors diving Chinese log price down. This is expected to result in unpruned export log prices coming down to just above two and five-year trend levels over the next month or so, i.e. around the NZ$110/JAS m3 for “A” grade. Pruned logs should be a little less volatile. Korea and India should continue to provide some alternative sales options at prices sometimes better than those available from China. However, China tends to drive sentiment across all markets.